In today’s rapidly changing world, the speed at which your organisation learns can be a competitive advantage. The world is changing, and the rate of change is speeding up. In the past, when progress was slower and the rate of change was lower, an organisation could compete on its products, its patents, its reputation and on its people. However the rate of change is increasing, and companies need to adapt. Markets are changing, customers are changing, expectations are changing, regulations are changing, the world is changing, and it is changing faster and faster. If companies are to adapt, they need to unlearn old habits and learn new ones. And in a competitive world, the fastest learner wins. 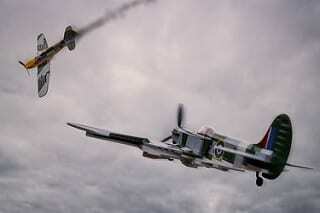 The analogy is with the aerial dogfights in the first world war. There, the maneuverability of the aircraft was key. If you could maneuver faster than the opposition, you could get inside their turning circle, and shoot them down. Today, the learning agility – the intellectual maneuverability – of a competitive organisation is key. If you can get inside the opposition’s learning circle, you can shoot them down. So how fast is your learning circle? How quickly does the organisation learn from experience? How long does it take for a new lesson from experience to become embedded into the way you work? How long does it take a question in a Community of Practice to be a) asked and b) answered? How long does it take a piece of new knowledge to show up in the company knowledge base, and how long does it take for this to be re-used and applied? Do you even know? Do you have the metrics to measure your speed of learning, as an organisation? Contact Knoco if you need help with tuning up your learning circle! In step 2, the project should identify its knowledge gaps, through a process such as Knowledge Gap Analysis or KM planning. Through this process, the team becomes clear what they don’t know, but can learn from others. 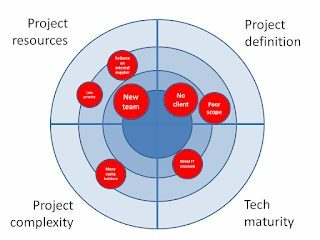 As far as the project team is concerned, these are the Unknown Knowns; things that others know, that the project team doesn’t. Here the team needs to learn from the wider organisation as described in yesterday’s post, or learn from other organisations. 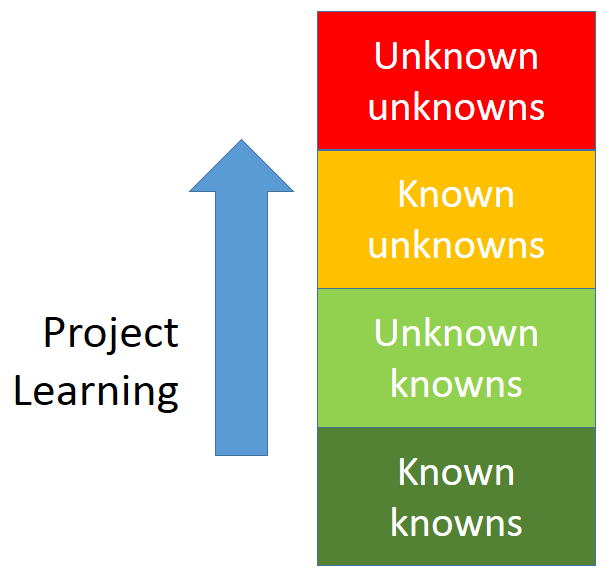 By mapping out the known knowns, the project team can then limit their scope to the truly unknown (because if they start researching known territory. they are wasting effort and reinventing the wheel). (See for example Wilbur Wright’s attempt to map out the known knowns when researching Powered Flight). This step also helps overcome the overconfidence bias. In step 3, the project steps into the unknown. They define what they need to learn about but cannot just learn from others (the Known Unknowns), and put in place processes to gain that knowledge – R&D, Market Research, Rapid Prototyping, Business Driven Action Learning. Through these processes, they fill in the Known Unknowns as they become known. In step 4 the project butts up against the Unknown Unknowns – the nasty surprises. They can only address these by a secure process of “Learning while Doing” – through After Action Reviews or some other process of project learning. They won’t discover all the Unknown Unknowns, but can make some headway into this territory. The importance of "learning urgency"
How urgent is learning in your organisation? When I give my Knowledge Management Training courses, I start proceedings by presenting three stories from organisations who are doing knowledge management, showcasing some of the benefits KM can bring. I then ask the class to discuss the stories, and to identify the success factors that lie behind each one. Often these are a mix of successful interventions, and successful cultural elements. One of the success factors a recent class identified was a “sense of urgency“. In each case, the protagonists in the story treated learning as Urgent – one of the first things to be done before leaping into action – and as a result, delivered great results. This was a really good insight. All too often, learning (and Knowledge Management in general) is seen as important, but not treated as urgent. In these stories, the urgency was there, and learning followed. So how had the organisations in the stories created that sense of urgency? In the first story, the organisation gave a high-profile task to an individual who had never done that sort of thing before, with clear instructions not to “screw up”. A risky move, were it not for the Knowledge Management system which gave the individual all the knowledge they needed to succeed. In the second story, the organisation challenged a team to improve on the past benchmark performance by nearly 20%. An impossible challenge, were it not for the access the team was given to all the lessons and knowledge from past performance. In the third story, the organisation gave the same audacious goal to twelve different teams simultaneously. A crazy thing to do, were it not for the way they set up knowledge-sharing between the teams, so they reached the goal far faster collectively, then they did individually. There is a saying, by the Greek philosopher Epictetus, that “you cannot teach someone something they think they already know”. This means that if you give people problems they know how to solve, they will not look for additional knowledge, and they will not think outside the box. Learning, for them, will not be urgent. They will use the knowledge they have, do what they have always done, and deliver the performance they have always delivered. Safe, but no improvement. An organisation can really drive Knowledge Management by giving people challenges they don’t know how to meet, or putting them in positions where they don’t know what to do. This is not as risky as it sounds, once KM is in place. Once KM is in place and is trusted, KM and management work together in delivering breakthough performance. Management gives people challenges they don’t know how to meet, KM provides the knowledge they need to meet them. Learning becomes both Urgent, and Easy. Everybody wins. The Risk Radar – what could possibly go wrong? An analysis of your past lessons can be used to create a Risk Radar for future projects. Michael Mauboussin, in his book “Think Twice”, talks about the planning fallacy, and compares the inside and outside view. 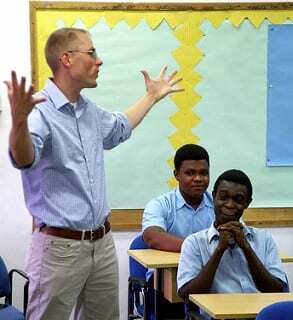 He points out that people planning a task or a project tend to take the inside view – they think through how they will do the project, they think about the risks and challenges they will face, and how they will overcome them, they add up the times for each step, and use that as their baseline. Almost always they are over-optimistic, unless they also use the outside view, and calibrate their baseline against what usually happens. 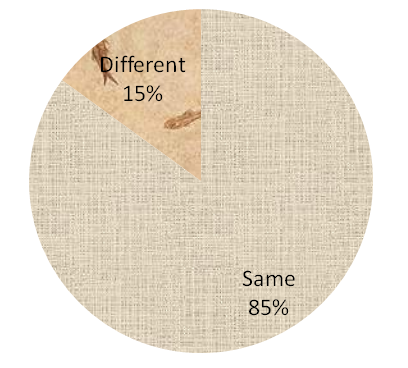 To find out what happened to people in similar situations, we can use Lessons Analysis. If you have an effective lesson learning system you may have records from hundreds or thousands of past projects, and you have a huge database of “how things turned out”. Through lessons analysis you can recognise common themes across a number of lessons, and see the challenges and risks that projects are likely to meet, and identify those which are most common and most impactful. You can then use these to create a risk radar for future projects. In the 90s, I was in charge of a lesson-learning system in Norway. At one point we had lessons from over 300 projects in the system, and we grouped them into a series of “things that commonly go wrong in our projects”. The project is a low priority ‘back-burner’ project. The project scope is poorly defined. The project involves consultation with large numbers of staff. Any project where more than one of these was true had “Danger on it’s Radar”. Such a project therefore needed to pay considerably more attention than usual to project management, and was advised to scan back through the relevant lessons and guidance, and speak to the people involved, in order to find out how the danger can be averted. A few years later, the organisation applied the same concept to big engineering projects, and came up with what they called the “Train Wreck Indicator” – a similar indicator based on common reasons for failure, determined through lessons analysis. Any project that scored a Red Light on the train wreck indicator was given additional help and oversight in order to help it steer a path through the problem areas, and avoid becoming a train wreck. Tools such as this help projects gain the Outside View to aid them in their planning. If you have an effective lessons learned system, and are building up a library of project lessons, then consider a similar analysis, to build your own “Risk Radar“. Contact us if you want to know more about our lessons analysis service. People who have learned from experience must understand their responsibility to teach others. 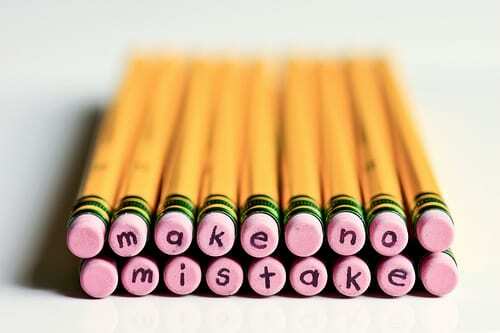 I often say at the start of Lessons learned meetings, that when identifying and recording lessons we should think of them not as something we have learned, but as something we can teach others. This is a subtle shift in emphasis form looking inwards, to looking outwards, and from looking backward, to looking forwards. It also identifies the responsibility of the knowledgeable person; a responsibility to others rather than to themselves. For much of the lessons workshop, the participants are looking back at what happened. “We had a difficult time with the client”, they might decide, and then follow this Observation with a whole set of reminiscences about how difficult the client was, and what trouble it caused. With good facilitation, they can also reach Insights about why the problems happened. However the facilitator then has to turn the conversation outwards, and ask – “based on what you have learned from your reflection on the client difficulties, what can we teach the organisation about how to better deal with clients”. The participants need to stop analysing history, and start looking at generic learning they can pass on to others. That is a critical value-added step, and it is that step, and the subtle mindset shift from passive learners to active teachers, that allows the participants to turn an observation and the subsequence insights, into a Lesson. 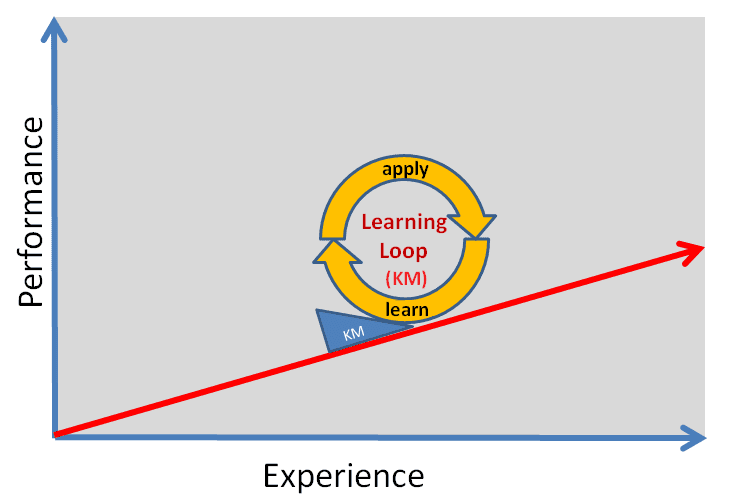 One of the standard models for Knowledge Management in project environments is the idea of “Learning Before, During and After“. For the project itself, the most powerful of the three is “Learning Before”. If a project can maximise it’s knowledge up front, especially if the team can discover the things it doesn’t know that it doesn’t know, then success is much more likely. “Learning Before” activities such as Knowledge gap Analysis, KM planning or Peer Assist can overcome some of the more serious cognitive biases for KM, and are the nearest thing to KM Silver Bullets that we have. Learning before activities drive receptivity, increase absorptive capacity, and help teams “want to learn”. 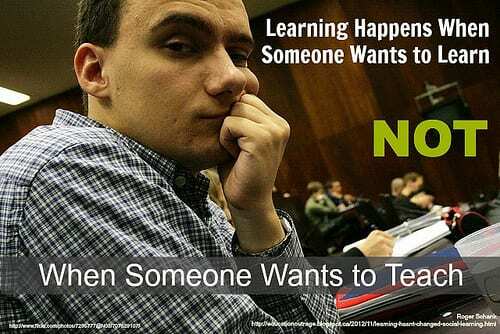 I think the answer is that it is psychologically easier to share than it is to learn. A project team can feel proud and recognised (even a little smug at times) for sharing lessons, while asking for lessons can feel like an admission of incompetence (“can anyone help me with this?”). Learning After is Teaching – Learning Before is Learning, which is Much Harder. Knowledge reuse is more difficult than knowledge sharing, yet that is all the more reason we should make it a focused and deliberate step. Please, let’s introduce the full cycle of Learning Before, During and After, and let’s not skip the Before step!